I wasn’t really enthused about when when I first looked into it. I’ve seen a lot of calendar tools and a lot more to-do list managers, and I didn’t see a whole lot that stood out at first glance. I don’t mean that I wish obscurity on when, only that it deserves to be digested at a decent pace. when makes a nicely formatted list out of a very simple arrangement. Follow the brief setup scheme, and from then on every instance of when e puts you in your $EDITOR. The data arrangement is very easy to follow: Just separate the date from the note with a couple of spaces and a comma. Leave your editor, and every time you enter when, you’ll get a list of upcoming events. Simple. But when can handle some fundamental date tests, and this is where when really kicks it into gear. when can sift out specific dates annually, so regular holidays, like Christmas or Valentine’s Day are easy to add. when can also filter for observed events too — so holidays or events that fall on a weekend can appear on regular weekdays. Now you can handle the complexity of scheduling Golden Week. Arranging simple date tests is a breeze too, and you can pluck out the traditional Father’s Day — as the third Sunday in June — with no more than m=jun & w=sun & a=3. And believe it or not, when has provisions for dates that precede the end of the month too, and the man page claims it can handle things like moveable feasts. That’s impressive. For a long time I was a strong proponent of the one-two knockout punch of wyrd and remind. But short of complex and detailed minute-by-minute calendars, wyrd/remind is overkill. On the other hand, calcurse does a decent job handling very simple calendar requirements, and its visual arrangement is a great asset. If I had to, I’d put when somewhere in between those two poles, and possibly even closer to the high-end wyrd/remind combination. I’m confident it can do some of the more challenging schedules that I would otherwise relegate to wyrd/remind, and it might even do them more quickly and gracefully. A small warning: I noticed that some more complex and lengthy calendar lists cause a slight pause when displaying. It should probably go without saying that complex tests and date calculations will take a while to display. If you’re on very old hardware, that might trigger a lag. Then again, if you have long, complicated scheduling requirements, you might be better off devoting a little more power to it than just your old leftover K6-2. This entry was posted in Linux and tagged calendar, manager, organizer, schedule, task on 2014/06/29 by K.Mandla. But I see a certain congruity. vit comes through on just about all the points I like in a full-screen console application — color, onboard help, good use of space, intuitive layout, and so forth. 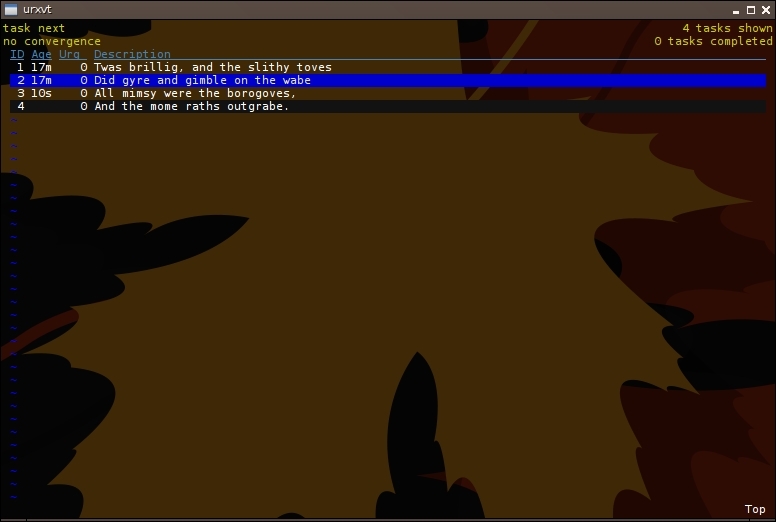 vit’s navigation is a near-duplicate of the vi/vim coalition, and if you like that arrangement, it will no doubt be an easy trick to learn how to work vit. And if it doesn’t fall immediately into place for you, entering the time-honored command :help gives you a scrollable list of keypresses and their definitions. I have no major complaints about vit; it does make the transition to taskwarrior a lot more appealing to me. taskwarrior on its own was not my favorite, but vit makes a good catalyst. This entry was posted in Linux and tagged manager, organizer, task, to-do on 2014/06/21 by K.Mandla. So if the author of tofu is cunning, and I have no reason to believe he/she is not, then the pronunciation of the program might be “too foo,” which would hearken back to the old placeholder names of foo and bar. Neat. Most task organizers to date have relied on metadata or tagging systems to show priority or somehow arrange tasks in a list; tofu takes the more direct route and connects importance to position in the list. The top item is the most important, and the bottom is the least. It’s the arrangement that determines priority. To that end, tofu adopts some very unusual ways to manipulate the stack. There are the conventional add (which works as “next”), delete and edit tools, as well as a “read” command to show a brief synopsis. However there is also the “jump” command, which can yank a task or a series of tasks, and promote or demote them within a list. I don’t recall any other to-do manager that can pull arbitrary items and insert them into the stack again, at a specific position. What’s more, tofu can handle a barrage of list adjustments all on one line. So not only does tofu 3 4 jump=2 work, but also tofu 5 7 jump=2 3 jump=1 list. Very convenient. tofu also has a tagging system, with the “stamp” command. As you might imagine, multiple items can be tagged at once, with something as simple as tofu 2 3 8 stamp=Important. Multiple tags can be listed with commas between, and all applied at once. I like programs that can approach a traditional problem and come up with a new way to tackle it. If you can get used to working the stack to show priority, tofu can probably offer a quick and unusual way of organizing it. This entry was posted in Linux and tagged manager, organizer, task, to-do on 2014/06/05 by K.Mandla. I mentioned this quite some time ago, when I brought punch to center stage, and technically speaking that was done out of order. Ideally, we should have talked about the task organizer before the time clock add-on, but it’s water under the bridge now. I suppose it’s not the fault of todo.txt that lifehacker.com left its greasy fingerprints on it. And perhaps I’m not being fair by immediately assuming that lifehacker.com is just glomming onto an otherwise useful script in hopes of pulling a little traffic its own way. Then again, I just checked and the top story on that site is how to remove stains from your clothes with Windex. 😯 Yeah, I’ll trust my instinct this time: They’re glomming. Let’s get back on track. 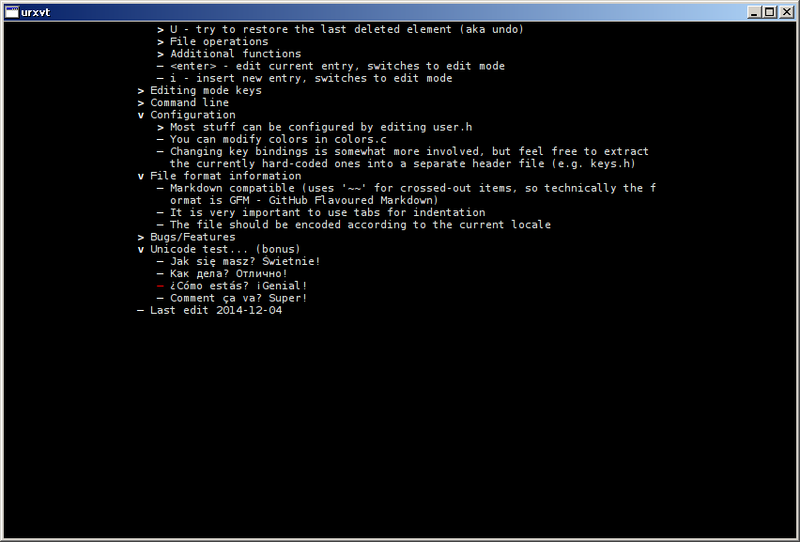 Here’s todo.txt, which installs as todo.sh in Arch. You’ll need to copy the default configuration file from /usr/share/todotxt/todo.cfg to ~/.todo/config before you can get any meaningful work done with todo.txt. 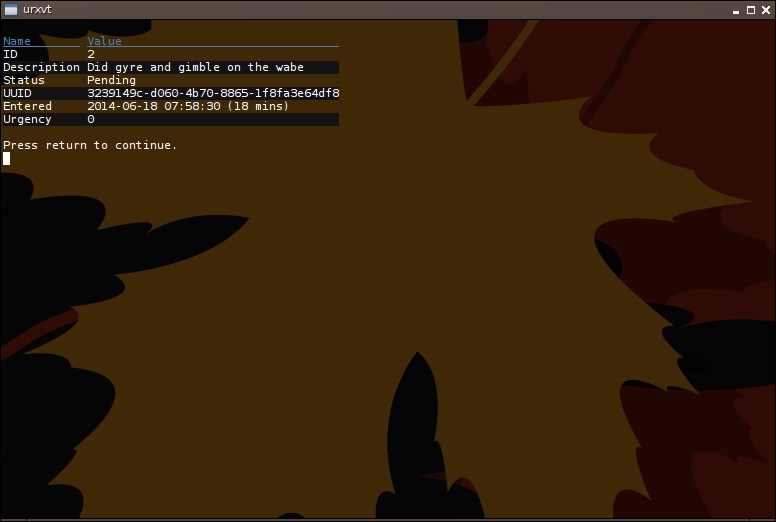 Mostly it just wants the location of your todo.txt file, and I have no problem supplying that. 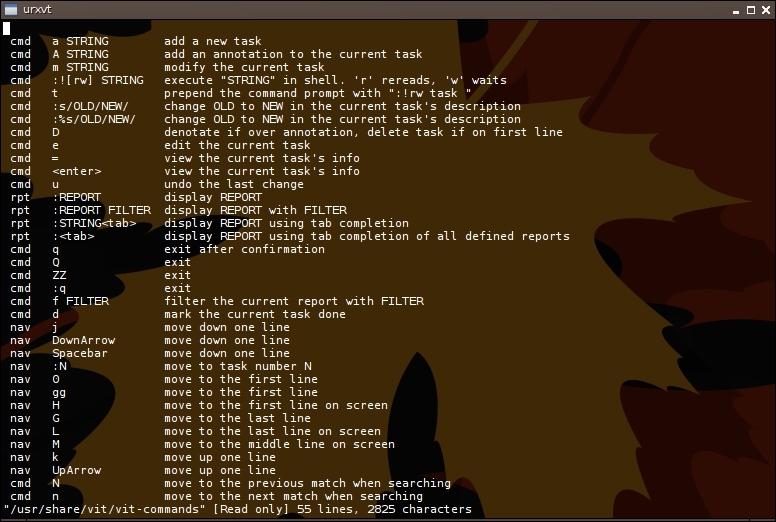 todo.txt uses the command-line parser approach, sort of like taskwarrior and tdl, among others. There is a full compliment of commands to cover just about every aspect of task management — add, delete, prioritize, do. todo.txt adds the concept of “archiving” finished tasks, as well as the only-slightly-more-common ability to generate reports. There are also a half-dozen ways to list your tasks, whether it’s by priority or some other criteria. Learning todo.txt is fairly easy, since todo.sh help (command) tells you everything you need to know about any single command, and how it is arranged. I daresay that is more useful than a man page or a few help flags. As I understand it, todo.txt arranges separate lists through folder structures, so if you want more than one list, be prepared to work within a folder tree. 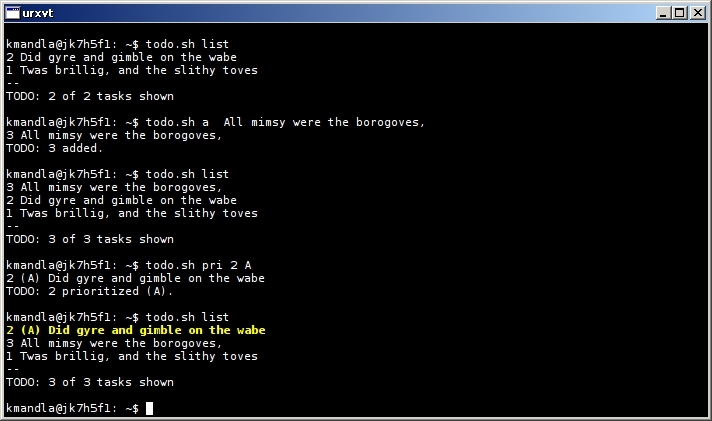 todo.txt does not live up to the clean and fashionable output of todo.c though; todo.txt seems to stack tasks from newest to oldest, prefixing an item with its priority if it has one. In that sense, todo.txt definitely has something to learn from the little guy. I also find it a little taxing after working with todo.c and t, to find that just todo.sh generates a brief help message, rather than dishing out the list of things in my todo.txt file. todo.txt also seems to lack some of the intricacy that taskwarrior can give, or some of the interactive element present in tdl or others from long ago. It’s not a terrible solution though, and I don’t intend to disparage it to any degree. I just feel it’s a buyer’s market for task organizers and to-do list managers, and todo.txt doesn’t do the job with any real flair. It’s easily forgotten, from my perspective. Taking a quick look at the home page though, it’s obvious that its appeal is in its widespread adoption between operating systems and devices. So it may be that its middle-ground approach makes it easier to pick up, if you rely on more than one gadget to get things done.